Atopic dermatitis is an hereditary condition in which individuals react to allergens with an inflammatory skin condition. It belongs to a group of allergic disorders that include food allergies or intolerance, allergic rhinitis, and asthma. Dogs appear, as a species, to be particularly prone to dermatitis. There are many accounts from holistic practitioners who say that skin conditions in dogs flare up shortly after a vaccine event; they often attribute skin problems to the vaccine miasm (a condition whereby vaccine damage is passed from one generation to the next). Supporting evidence comes from two scientists named Frick and Brooks (1) who showed that dogs who are genetically predisposed to develop atopic dermatitis didn’t develop this inheritable condition if exposed to an allergen before they were vaccinated. But they did develop atopic dermatitis if they were exposed to an allergen after being vaccinated. From this we can hypothesise that individuals (whether human or animal) can have latent genetic traits that may remain dormant until something – such as a vaccine – triggers the predisposition. One study in humans stated that the condition has increased twofold to threefold since the 1970s. A number of studies have linked atopic dermatitis in humans to vaccines, specifically the measles, mumps and rubella vaccine, measles infection, and the BCG (tuberculosis) shot (2,3). Measles and distemper are ostensibly the same virus, so I query distemper virus in MLV vaccines as being a possible underlying cause for canine atopy. Another study (4) looks at the role of IgE antibodies in atopic dermatitis and refers to post-vaccination specific IgE responses to tetanus and diphtheria toxoid, which could result in adverse events to future vaccination or exposure to the diseases. This refers to the fact that, in IgE responses, the first exposure to an allergen sensitises the individual, and the second causes an allergic response which can lead to fatality. Unfortunately, the evidence isn’t clear cut. There is no acknowledged single cause for atopic dermatitis, and it probably represents more than one condition. There are many theories regarding the underlying mechanisms. Current research is investigating the roles of gene mutations, defects in the skin cells (5), the immune system, skin surface microbes (bacteria, viruses and yeasts), and ‘environmental’ factors. Viruses are parasites that incorporate themselves into their host’s genes. I wonder if any geneticist has looked for an association between vaccine-strain viruses and heritable atopy? The same problem appears in canine studies. I could find no evidence of clear genetic markers. Rather, the full potential of the high IgE response gene appears to be fulfilled only under certain conditions, such as early and repeated allergen exposure. One study showed that dogs born in April in America had a higher incidence of atopy, indicating a possible link to pollen overload in these cases. In one attempt to establish a colony of dogs with atopic dermatitis, only 13 out of 72 dogs of the progeny of patients with AD developed clinical signs of the disease. All of these dogs were between 13 and 24 months of age. Again, no difference in total serum IgE levels was found between clinically normal dogs and dogs with dermatitis. There were no indicators identified that could be used to predict the development of atopic dermatitis (7). However, there are antibody responses other than IgE in canine atopic dermatitis, which this study failed to look at. Food and inhalant allergies, as well as sensitivities, often lie behind dermatitis. Antibodies are proteins produced by B cells that are used by the immune system to identify and neutralise foreign objects such as bacteria and viruses. The problem with atopy is that the immune system is recognising normally harmless proteins as harmful. IgM antibodies can be found in saliva; their presence indicates a first-line defence against infection. IgA antibodies, also found in saliva, defend against invasion by inhaled and ingested pathogens. Food allergy is a severe, immediate and acute IgE response to eating a particular food. One example might be a peanut allergy, where the individual might die if she doesn’t have adrenalin on hand. Food sensitivity and intolerance relates to slower-acting and chronic symptoms, such as digestive and skin-related conditions, and is more commonly associated with IgA and IgM responses. The body may also mistakenly make antibodies against itself – autoantibodies – treating healthy organs and tissues like foreign invaders. This is called autoimmune disease. Inhalant allergies in dogs are characterised by feet chewing and licking, biting and scratching, and recurrent ear infections. The worst itching will be on his feet, hind legs, groin and armpits. Symptoms of food sensitivities / intolerance may be ear scratching, head shaking, itchy skin, licking and biting of the back legs, rubbing his face on the carpet, inflammation in his ears, coughing and, in rare cases vomiting, sneezing, and diarrhoea. Hot spots and skin infections can be caused by food sensitivities / intolerance, as can aggression and other unpredictable behaviours in dogs and cats. Although Merck warns of potential death from vaccines for immunocompromised individuals, some studies conclude that viral disease is so awful, and adverse vaccine reactions so ‘rare’, that we should vaccinate them anyway! T cells, by the way, belong to a group of white blood cells known as lymphocytes. They play a central role in cell-mediated immunity. There are several types of T cells which perform a variety of functions, including the maturation of B cells, the production of cytokines which assist in the immune response, destruction of tumor cells, prevention of autoimmune disease, and providing memory against past infection. Th1 deficiencies are associated with autoimmune disease, and Th2 deficiencies are associated with atopic disease. AW Taylor, University of Leeds, wrote in Allergy: “Asthma, tuberculosis, cancer, myalgic encephalomyelitis, and Gulf War syndrome have all been linked recently to a shift in the immune profile favoring a T helper 2 (Th2) cell bias. This situation has been associated with the multiple vaccinations given to troops before Gulf combat. The incidence of asthma is on the increase and so is the use of multiple vaccination procedures. When pertussis is combined with diphtheria and tetanus (the DTP vaccination given in the UK to 8-week-old babies along with Hib [Haemophilus influenzae] and, in some cases, tuberculosis), the same immune deviation develops, a bias towards Th2 responsiveness. Perhaps this is why some dog owners have noticed positive effects when rejecting multivalent vaccines and giving distemper and parvo separately, separated by a few weeks. Immunodeficiency is differentiated between primary and secondary. Primary immunodeficiency is caused by genetic or developmental defects in the immune system. These defects are present at birth but may show up later on in life. There is, incidentally, a correlation between hypothyroidism and IgA and IgM deficiency (8) (i.e., if your dog has skin problems, check his thyroid function with a complete thyroid antibody profile). Secondary or acquired immunodeficiency is the loss of immune function as a result of exposure to disease agents, environmental factors, immunosuppression, or aging. Secondary disorders occur in normally healthy individuals who are suffering from a disease that weakens the immune system temporarily. All of these factors, bar aging, would point to vaccination, since vaccines contain disease agents, cause immunosuppression, and are ‘environmental factors’. Skin flare-ups in non-atopic dogs post-vaccination would therefore be possible. Bacterial, viral (and presumably vaccines containing bacteria and viruses), protozoan, worm, and fungal infections may also lead to B and T cell deficiencies. Merck also tells us that serum (found in vaccines) can cause Type III hypersensitivity reactions, including a highly inflammatory skin condition involving painful local lesions leading to tissue necrosis (the death of cells), as well as widespread vascular (blood vessel) injury. This reminds me of Spangler, the Golden Retriever whose skin began to split and die shortly after he was vaccinated. The vaccine manufacturer of course denied any possible link, although the independent path lab was ‘unable to rule a connection out’. Spangler’s story can be read in full at http://www.canine-health-concern.org.uk/Vaccines%202.pdf. Unfortunately, Spangler’s skin was so badly damaged, and he was in so much pain, that he had to be euthanised. There is also a case of a Shar-Pei called Sumo in What Vets Don’t Tell You About Vaccines who required extensive skin grafts after his skin began to split post-vaccination. Another case involves a human child who also required extensive skin grafts post-vaccination. Extensive skin splitting, of course, is a relatively rare and extreme response to vaccination. A food allergy is defined as an adverse response to a food protein. Vaccines, by their method of manufacture, contain many ‘foreign’ proteins, including animal serum, usually cow blood product. 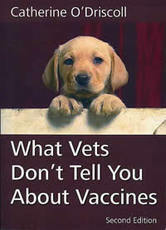 Professor Larry Glickman, who I have often quoted in relation to the Purdue vaccination study, has acknowledged that the autoantibodies dogs developed post-vaccination to a wide range of their own biochemicals in his study were likely due to the dogs mistaking their own biochemicals for the invading cow serum in the vaccine, which was directly injected into their blood stream. Additionally, some ingested proteins or fragments of proteins become resistant to digestion, and those that are not broken down during the digestive process are tagged by IgE antibodies. These tags fool the immune system into thinking that the protein is harmful. Allergic/sensitivity responses to the protein include dermatitis, gastrointestinal and respiratory distress, and can also include life-threatening anaphylactic responses which require immediate emergency intervention to avoid death. I will discuss the role of the digestive process in relation to atopy later. Apart from cow serum in vaccines, many vaccines are cultivated on eggs and the body parts of various species. Some vaccines contain peanut oils. I don’t doubt that the rise in human allergies to dairy products, eggs, and peanuts might have something to do with the vaccine programme. Egg albumin is used in laboratories to induce anaphylaxis, and the peanut allergy/vaccine connection has been well made. Putting food in vaccines might also explain why dogs are now becoming allergic to their biologically appropriate carnivorous – protein – diet. These foodstuffs are being injected directly into the bloodstream where they are recognised by the immune system as invaders. Would it surprise you to discover that wheat germ, corn and soy oils are also used in vaccines, and that wheat, corn and soy allergies are on the rise? Science has known about this problem for many years. In 1901, French scientist Charles Richet coined the word anaphylaxis to designate the sensitivity developed by an organism after being given an injection of protein or toxin. In 1839, the French physiologist Francois Magendie created allergy-like symptoms in animals, finding that animals sensitized to egg white by injection died after a repeat injection. Brandt and colleagues induced an allergy to chicken eggs in a group of mice by injecting them with an egg protein. In Pediatr Allergy Immunol 1994 May;5(2):118-23, the role of aluminium for IgG and IgE responses to pertussis toxin, as well as side effects, was investigated in 49 children with known atopy status. The addition of aluminium to pertussis vaccine was associated with strong IgG antibody response, and a stronger IgE antibody response. The study concluded that the role of immunization in the development of allergy merits further studies. There is another theory that needs to be discussed in relation to atopic dermatitis, called the hygiene theory. Scientists have found a correlation between the hygienic Western way of life and the rise in atopy. There is also a negative association between the presence of parasitic worms and atopy (12). In summary, the incidence of atopy in human children is lower if there is infection and some exposure to worms. Dr Viera Scheibner, astute vaccine researcher, has found that vaccinated children are more prone to cancer and leukaemia than children who have suffered childhood infectious diseases. In one study, measles infection was negatively associated with house dust mite allergy (13), supporting the premise that viruses have a protective role, and that sensible breeding and proper husbandry is the best defence against viral disease (allowing the individual to mount a strong immune response and survive infection). The use of broad spectrum antibiotics appears to increase the risk of atopy (11, 12). Atopic individuals are also more prone to yeast infections – this relates, in part, to under-functioning antibodies; the term ‘lazy immune system’ has been suggested (14). Yeast is also used in vaccines. Additionally, imbalanced gut bacteria and the paucity of dietary enzymes (found in raw food) play a role in atopy and lead to yeast overgrowth. One could postulate that maternal yeast infection might pose a high atopy risk to subsequent puppies, and that breeders and new puppy owners should be aware of yeast overgrowth and know how to deal with it quickly. As stated earlier, bacterial and fungal infections can lead to B and T cell immunodeficiencies. It seems clear that Western animal husbandry, reliant as it is upon processed food, vaccines, wormers and antibiotics, not only predispose to inhalant and food allergies, and dermatitis, but they also predispose to more life-threatening autoimmune diseases. Vaccines not only derange immune response, but by preventing infection, they prevent the immune system from establishing homoeostasis. Frick OL, Brooks DL. Immunoglobulin E antibodies to pollens augmented in dogs by virus vaccines. Am J Vet Res 44: 440, 1981.